Editorial note: The name ‘Aertssen’ is spelled in various ways in the 17th century archival documents that were examined. As the spelling ‘Aertssen’ is recorded in the 1617 panel maker’s petition this version will be used in JVDPPP publications. Name variants are: Aertssen, Aertssens, Artsen, Artsens, Aerts, Arts. 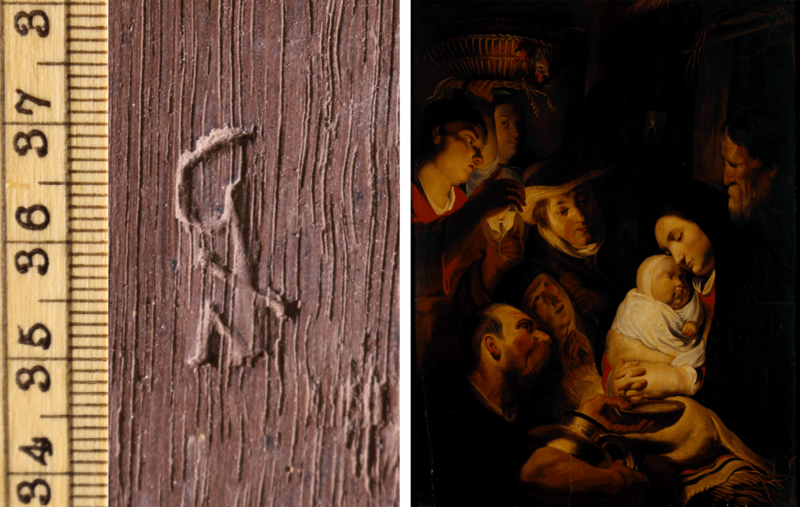 It should also be noted that the drawn mark in the November 1617 panel maker’s petition does not correspond exactly to the mark found on the reverse of panels and identified as that of Guilliam Aertssen by Jan Van Damme. The petition is written by one hand, probably that of a scribe, including the names of the panel makers and the drawn marks, not the panel makers themselves. This might explain the slight differences between the drawn and found punch marks for several panel makers. For the entry on Guilliam Aertssen in Jan Van Damme’s article on panel makers (1990), click here. How to cite: Moortgat, Ingrid. “Guilliam Aertssen – A Biographical Timeline.” In Jordaens Van Dyck Panel Paintings Project. Edited by Justin Davies. Guilliam Aertssen, son of Cornelis Artsen and Maeijken was baptised in Antwerp. Note: Cornelis Aertssen was probably the joiner who manufactured a pulpit for the Antwerp church of St Jacob in 1585. Maeijken is the first name of his mother, her surname is not mentioned. State Archives Belgium / Rijksarchief België, parish Onze-Lieve-Vrouw, parochieregisters doopakten, 1576-1580. Felixarchief / Antwerp City Archives, Certificatieboeken, CERT 43, f 300-301, 9-11-1582. Felixarchief / Antwerp City Archives, Privilegiekamer, PK 3202, Archief St Jacobskerk 1379-1891, archiefvormer Emiel Dilis, p 199. On the 16th of January 1612 Guilliam Aertssen and Jan van Haecht, merchant in paintings, settled their accounts and Aertssen signed a credit note for 238 guilders and 17 ½ stivers. Felixarchief / Antwerp City Archives, Notariaat, Notaris Hendrick van Cantelbeck, N 3381, 1627. Erik Duverger, Antwerpse kunstinventarissen uit de zeventiende eeuw, Brussel : Koninklijke Academie voor Wetenschappen, Letteren en Schone Kunsten van België, 1984-2009, vol 3, p 56. Guilliam Aertssen(s), ‘lystmaker’ (frame maker), became a member of the Guild of St Luke in Antwerp in 1612. Note: the Guild year began sometime round about the saint’s day of St Luke, the 18th of October. Royal Academy of Fine Arts Antwerp, KASKA, Oud Archief Sint Lucasgilde, 70 3, 1612. Philippe Rombouts en Théodore van Lerius (1872), De Liggeren en andere historische archieven der Antwerpsche Sint Lucasgilde, afgeschr. en bewerkt door P. Rombouts en T. van Lerius, 2 deelen, (Antwerpen: Feliciaen Baggerman, 1872), vol 1, p 484. Jan van Damme, “De Antwerpse tafereelmakers en hun merken: identificatie en betekenis”, in Jaarboek voor het Koninklijk Museum voor Schone Kunsten, pp. 193-236, Antwerp: Royal Museum Antwerp, 1990, 212-214. In the Guild’s books of the same year 1612 Guilliam Aertssen is mentioned as a ‘tafereelmaker’ (panel maker). Guilliam Aertssen did an assessment of the wood and tools in the workshop of panel maker Michiel Claessens together with panel maker Jacques Luytsens. Michiel Claessens had an inventory of his possessions made on the 20 November 1614 before he married his third wife Johanna Verspellen. Claessens requested the ‘tafereelmaeckers’ (panel makers) Guilliam Aertssen and Jacques Luytsens to do an assessment in his workshop. It was common for wealthy people to have these inventories made before a second or third marriage to avoid inheritance issues afterwards. Felixarchief / Antwerp City Archives, Notariaat, Notaris Bartholomeus Van den Berghe, N 3492, 20-11-1614. Mentioned by Jan Van Damme, op cit., but with the incorrect date of 1624. Guilliam Aertssen, ‘lijstmaker’ (frame maker), lived in the Breestraete in the Antwerp parish of St George. Note: Jacques Luytsens (see above) lived on the same street and is also described as a ‘lijstmaker’. Guilliam Aertssen’s name was recorded on the panel maker’s petition to the Mayor and the aldermen of the city of Antwerp. 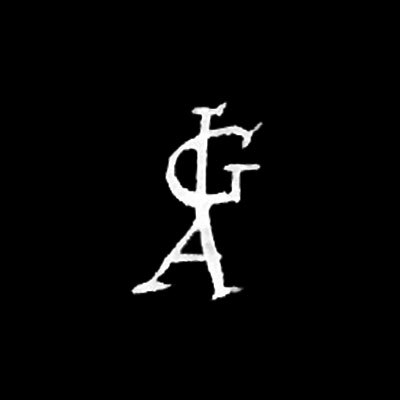 The panel makers and the Guild of Saint Luke took the painters/art dealers Lucas Floquet and Gaspar Antheunis to court for the use and the production of panels of terrible quality and panels without panel maker’s marks. Also, for having employed the panel makers Guilliam Aertssen and Ambrosius Engelant in a closed, private house instead of an open shop. They also accused Guilliam Aertssen of working for Gaspar Antheunis, of keeping Antheunis’ shop open and of ordering his own employee to work for Antheunis. Lucas Floquet, Gaspar Antheunis, Guilliam Aertssen and Ambrosius Engelandt received a fine for the use of unmarked panels and a prohibition to make panels behind closed doors. Panels and frames should be manufactured in open shops by free masters. Legal proceedings of the Guild of St Luke and its panel makers against Lucas Floquet, Jaspar Antheunis and Ambrosius Engelant. Royal Academy of Fine Arts Antwerp, KASKA, Oud Archief Sint Lucasgilde, 99 83 and 103 81. Felixarchief / Antwerp City Archives, Notariaat, N 538, 1623-1628. Guilliam Aertssen worked as a panel maker in a workshop in his own residence. Royal Academy of Fine Arts Antwerp, KASKA, Oud Archief Sint Lucasgilde, 103 81. A Guilliam Aertssen was referenced in the Vierschaarboek: Guillam Aertssen against Adriaen de Brouwer. Note: this is a reference to a legal proceeding, possibly concerning the painter Adriaen Brouwer, who died in Antwerp in January 1638, the contents of which can no longer be traced. Felixarchief / Antwerp City Archives, Vierschaarboek, V 156, 26-03-1638.